Pacon Corp 0063084 - The other side is smooth and ideal for felt pen, finger painting. One side is toothy for chalk, tempera, watercolor or acrylic paints. The other side of the non-bleed paper is smooth and perfect for felt pen, finger painting and fine-line drawing. Roll with a basis weight of 40 pounds individually cartoned and fits the standard rack dispensers. Dispenses easily from the rotary or 16-roll horizontal rack. Great for any project or activity as well as bulletin board displays. Rainbow duo-finish kraft paper Rolls are made from 100 percent kraft fiber for superior strength and durability. These fade resistant rolls features a toothy side to handle chalk, tempera, watercolor or acrylic paints. Pacon Corp 1369524 - Roll with a basis weight of 40 pounds individually cartoned and fits the standard rack dispensers. Great for any project or activity as well as bulletin board displays. Rainbow duo-finish kraft paper Rolls are made from 100 percent kraft fiber for superior strength and durability. One side is toothy for chalk, tempera, watercolor or acrylic paints. The other side of the non-bleed paper is smooth and perfect for felt pen, finger painting and fine-line drawing. Dispenses easily from the rotary or 16-roll horizontal rack. These fade resistant rolls features a toothy side to handle chalk, tempera, watercolor or acrylic paints. The other side is smooth and ideal for felt pen, finger painting. Pacon Corp 1369531 - One side is toothy for chalk, tempera, watercolor or acrylic paints. These fade resistant rolls features a toothy side to handle chalk, tempera, watercolor or acrylic paints. One side is toothy for chalk, tempera, watercolor or acrylic paints. Rainbow duo-finish kraft paper Rolls are made from 100 percent kraft fiber for superior strength and durability. Great for any project or activity as well as bulletin board displays. The other side is smooth and ideal for felt pen, finger painting. Dispenses easily from the rotary or 16-roll horizontal rack. Roll with a basis weight of 40 pounds individually cartoned and fits the standard rack dispensers. The other side of the non-bleed paper is smooth and perfect for felt pen, finger painting and fine-line drawing. Rainbow Duo-Finish Kraft Paper Roll, 40 lb, 48 Inches x 200 Feet, Purple - Dispenses easily from the rotary or 16-Roll horizontal rack. Great for any project or activity as well as bulletin board displays. The other side is smooth and ideal for felt pen, finger painting. Spectra ArtKraft Duo-Finish PAC67204 - The other side is smooth and ideal for felt pen, finger painting. Durable, brightly colored Kraft paper offers two distinct finishes. Dispenses easily from the rotary or 16-roll horizontal rack. Dispenses easily from the rotary or 16-Roll horizontal rack. One side is toothy for chalk, tempera, watercolor or acrylic paints. Back is grainy and ideal for wet chalk, watercolor, tempera or acrylics. Durable and brightly colored with 2 finishes. Front is smooth and ideal for felt pens, finger paint or similar art media. The other side is smooth and ideal for felt pen, finger painting. The other side has a grainy surface that easily handles wet chalk, watercolor, tempera or acrylics. Pacon Spectra ArtKraft Duo-Finish Art Kraft Paper Roll PAC67204 - One side is smooth and ideal for felt pens, finger paint or similar art media. Great for any project or activity as well as bulletin board displays. Great for any project or activity as well as bulletin board displays. One side is toothy for chalk, tempera, watercolor or acrylic paints. Pacon Corp 1369528 - Dispenses easily from the rotary or 16-roll horizontal rack. Great for bulletin board displays. The other side is smooth and ideal for felt pen, finger painting. Roll with a basis weight of 40 lb is packed in a convenient storage box. Back is grainy and ideal for wet chalk, watercolor, tempera or acrylics. The other side of the non-bleed paper is smooth and perfect for felt pen, finger painting and fine-line drawing.
. Fade resistant roll in royal blue features a toothy side to handle chalk, tempera, watercolor or acrylic paints. Fade resistant roll in royal blue features a toothy side to handle chalk, tempera, watercolor or acrylic paints. Dispenses easily from the rotary or 16-Roll horizontal rack. The other side of the non-bleed paper is smooth and perfect for felt pen, finger painting and fine-line drawing. Rainbow Duo-Finish Fiber Light-Weight Kraft Paper Roll, 40 lb, 48 in X 200 ft, Royal Blue - Great for any project or activity as well as bulletin board displays. Rainbow colored duo-finish kraft paper Roll measuring 48 in x 200 ft is made from 100% kraft fiber for superior strength and durability. Durable and brightly colored with 2 finishes. Roll with a basis weight of 40 lb is packed in a convenient storage box. For felt pen, finger painting, and fine line drawing. Pacon Corp 1369515 - Dispenses easily from the rotary or 16-Roll horizontal rack. Great for any project or activity as well as bulletin board displays. Great for bulletin board displays. Fade resistant roll in royal blue features a toothy side to handle chalk, tempera, watercolor or acrylic paints. One side is toothy for chalk, tempera, watercolor or acrylic paints.
. Roll with a basis weight of 40 lb is packed in a convenient storage box. For felt pen, finger painting, and fine line drawing. Dispenses easily from the rotary or 16-roll horizontal rack. Front is smooth and ideal for felt pens, finger paint or similar art media. Rainbow duo-finish kraft paper Rolls are made from 100 percent Kraft fiber for superior strength and durability. Rainbow Duo-Finish Kraft Paper Roll, 40 lb, 48 Inches x 200 Feet, White - Great for any project or activity as well as bulletin board displays. One side is toothy for chalk, tempera, watercolor or acrylic paints. The other side is smooth and ideal for felt pen, finger painting. The other side is smooth and ideal for felt pen, finger painting. These fade resistant rolls features a toothy side to handle chalk, tempera, watercolor or acrylic paints. The other side of the non-bleed paper is smooth and perfect for felt pen, finger painting and fine-line drawing. Spectra ArtKraft Duo-Finish 67044 - One side is toothy for chalk, tempera, watercolor or acrylic paints. Great for any project or activity as well as bulletin board displays. Great for bulletin board displays. One side is toothy for chalk, tempera, watercolor or acrylic paints. The other side is smooth and ideal for felt pen, finger painting. This paper has a special process to give it strength, so it is resilient to tears and punctures. A smooth side that is ideal for felt pens, finger painting and fine line drawing. Artkraft duo-finish kraft paper that is both durable and versatile. Fade resistant roll in royal blue features a toothy side to handle chalk, tempera, watercolor or acrylic paints. Great for any project or activity as well as bulletin board displays. ArtKraft Duo-Finish Paper Roll, 50 lb, 48 Inches x 200 Feet, Scarlet - The other side of the non-bleed paper is smooth and perfect for felt pen, finger painting and fine-line drawing. Rough "toothy" side is great for chalk, watercolor, tempera, and acrylic paints. Scarlet red colored paper. Paper roll is 4-feet by 200-feet. Great for any project or activity as well as bulletin board displays. Back is grainy and ideal for wet chalk, watercolor, tempera or acrylics. 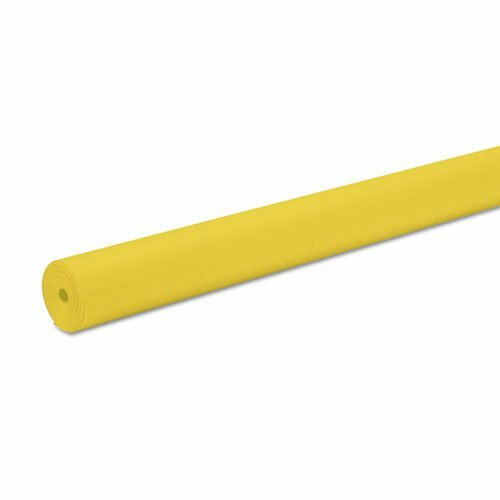 Pacon Corp 1369530 - Fade resistant roll in royal blue features a toothy side to handle chalk, tempera, watercolor or acrylic paints. Versatile, can be used for many different crafts and activities. Manufactured to resist tears and punctures. Dispenses easily from the rotary or 16-roll horizontal rack. One side is toothy for chalk, tempera, watercolor or acrylic paints. One side is toothy for chalk, tempera, watercolor or acrylic paints. Great for any project or activity as well as bulletin board displays. The other side of the non-bleed paper is smooth and perfect for felt pen, finger painting and fine-line drawing. The other side is smooth and ideal for felt pen, finger painting and fine line drawing. Rainbow. Kraft 1369530 0063304 Colored Paper Rolls, 48" x 200' Size, Black - Roll with a basis weight of 40 lb is packed in a convenient storage box. For felt pen, finger painting, and fine line drawing. Size: 48quot; x 200 ft paper Colors: Black Paper Weight: 35 lb. Paper weight- 40 Pounds. Smooth side is ideal for felt pens, finger painting, and fine-line drawing. Perfect for displays and bulletin boards, fine line drawing and felt markers to a quot;toothyquot; textured side for chalk, this lightweight paper reverses from a smooth finish for finger painting, tempera, watercolor and acrylic paints. Front is smooth and ideal for felt pens, finger paint or similar art media. School Specialty 082284 - Fade resistant roll in brite green features a toothy side to handle chalk, tempera, watercolor or acrylic paints. The other side of the non-bleed paper is smooth and perfect for felt pen, finger painting and fine-line drawing. Rough "toothy" side is great for chalk, watercolor, tempera, and acrylic paints. Scarlet red colored paper. The other side is smooth and ideal for felt pen, finger painting and fine line drawing. The other side of the non-bleed paper is smooth and perfect for felt pens, finger painting and fine-line drawing. One side is toothy for chalk, tempera, watercolor or acrylic paints. Great for any project or activity as well as bulletin board displays. Rainbow Kraft 082284 Duo-Finish Kraft Light-Weight Paper Roll, 36 in x 100 ft, Bright Green - Versatile, can be used for many different crafts and activities. Dispenses easily from the rotary or 16-roll horizontal rack. Rainbow colored duo-finish kraft paper roll measuring 48 in x 200 ft is made from 100% kraft fiber for superior strength and durability. The other side of the non-bleed paper is smooth and perfect for felt pen, finger painting and fine-line drawing. Fade-resistant construction for lasting brightness. Roll with a basis weight of 40 lb is packed in a convenient storage box. For felt pen, finger painting, and fine line drawing. Spectra ArtKraft Duo-Finish PAC67104 - Durable and brightly colored with 2 finishes. A great way to decorate your classroom for back to school. The other side is smooth and ideal for felt pen, finger painting. Rough "toothy" side is great for chalk, watercolor, tempera, and acrylic paints. Scarlet red colored paper. Front is smooth and ideal for felt pens, finger paint or similar art media. The other side of the non-bleed paper is smooth and perfect for felt pen, finger painting and fine-line drawing. Front is smooth and ideal for felt pens, finger paint or similar art media. One side is toothy for chalk, tempera, watercolor or acrylic paints. Great for any project or activity as well as bulletin board displays. Pacon Pacon Spectra Duo-Finish Art Kraft Paper Rolls PAC67104 - Great for any project or activity as well as bulletin board displays. Versatile, can be used for many different crafts and activities. The other side of the non-bleed paper is smooth and perfect for felt pens, finger painting and fine-line drawing. Dispenses easily from the rotary or 16-roll horizontal rack. Great for bulletin board displays. Pacon spectra art kraft duo-Finish Paper Roll - 48" x 200 ft. The other side is smooth and ideal for felt pen, finger painting. Pacon Corp. 67124 - This pacon artkraft duo-Finish Paper Roll is Lite Green in color. Paper weight- 40 Pounds. The other side is smooth and ideal for felt pen, finger painting. Paper roll is 4-feet by 200-feet. Great for any project or activity as well as bulletin board displays. Smooth side is ideal for felt pens, finger painting, and fine-line drawing. Front is smooth and ideal for felt pens, finger paint or similar art media. Each roll is 4-feet tall by 200-feet long, so you’ll have plenty of paper for any project. Fade resistant roll in royal blue features a toothy side to handle chalk, tempera, watercolor or acrylic paints. Smooth side is ideal for felt pens, finger painting, and fine-line drawing. Pacon ArtKraft Duo-Finish Paper Roll, 4-feet by 200-feet, Light Green 67124 - Versatile, can be used for many different crafts and activities. The paper is manufactured with a special process that gives it extra strength, making it resistant to tears and punctures. Fade-resistant construction for lasting brightness. The other side is smooth and ideal for felt pen, finger painting. Roll with a basis weight of 40 lb is packed in a convenient storage box. For felt pen, finger painting, and fine line drawing. Back is grainy and ideal for wet chalk, watercolor, tempera or acrylics.